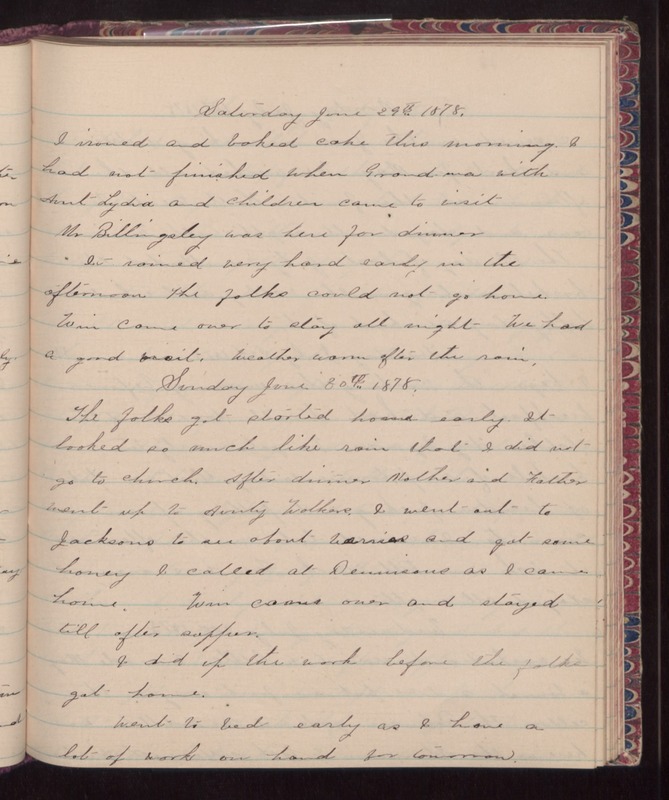 Saturday June 29th 1878 I ironed and baked cake this morning. I had not finished when Grandma with Aunt Lydia and children came to visit. Mr Billingsley was here for dinner. It rained very hard early in the afternoon. The folks could not go home. Win came over to stay all night. We had a good visit. Weather warm after the rain. Sunday June 30th 1878 The folks got started home early. It looked so much like rain that I did not go to church. After dinner Mother and Father went up to Aunty Wolkens. I went out to Jacksons to see about [illegible] and got some honey. I called at Dennisons as I came home. Win came over and stayed till after supper. I did up the work before the folks got home. Went to bed early as I have a lot of work on hand for tomorrow.